In the beginning there was land - lots of land, and that land was taken up by small farmers (and larger ones of course) around the general area. But as the district grew, so did the need for other industries and businesses. These are some of those businesses and industries that sprung up. John Dunn came to South Australia in 1839. He was the first to mill wheat into flour in the colony. He started out with a mill at Hay Valley near Nairne and later built the mill in Mt Barker. Today the Mill still stands and is now a Motel and Restaurant. John Barton Hack ran a dairy produce factory in the area in the 1805's. W. Jacobs & Sons owned and operated a cheese and milk factory adjacent to their meat products factory in Railway Terrace until about 1989/90. Milk was delivered by horse and cart to households in the town twice daily up to the end of World War 2. In the 1930's Mr Percy was the milkman. He sold his milk round to Bert Hillman who carried on the business until he went to war and took it up again after his return. Leather for saddleries, shoemakers, harness makers and the like provided a source of income for many Mt Barker families over the years. When I was going to school in the town in the 1960's, just about every family had someone working at either the Tannery or at Jacobs Factory. In 1892, E.A. Hallack describes the Tannery thus "The busiest [industry] now is that of Mr. T. Paltridge's tannery. It is about the third largest of that ilk in the colony, and employs twenty hands, and in the bark season four extra. Established 40 years ago by Mr Paltridge, it was then the beginning of small things, as he worked it solus. Now it thrives. The bulk of hides treated here are purchased in Adelaide, others as far off as Broken Hill, and unfortunately the lesser quantity locally. The average of those purchased is 200 per week, besides calf, wallaby and kangaroo. For the sale of leather Adelaide is the principal market, but local demands are also supplied." 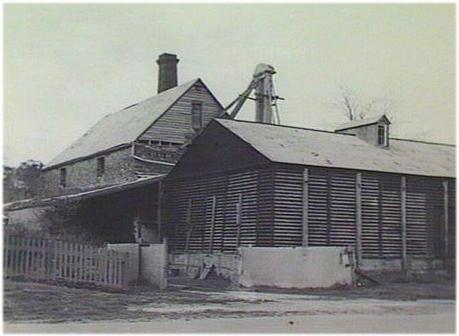 Paltridge's tannery also kept the wattle barking industry going locally, purchasing upwards of 300 tons of wattle bark per year. The Tannery was sold to Johnson & Co. Just prior to World War II there was a large fire in the premises which almost caused the company to go out of business, but it kept going until its final closure in 1975. The closure dramatically changed the lives of many Mt Barker families, with husbands, brothers and sons being put out of work. In 1853, the Hon. J.G. Ramsay established Ramsay & Co., a machinery building business in the town. They produced ploughs, scarifiers, earth scoops, wagons, road rollers and other implements. At one time there were 90 men employed here, but by 1892, the workforce had been reduced to only 24. This business has long since disappeared. Mr. C.E. Dutch manufactured windmills and cream separators in the town for a number of years. One of Dutch's more ingenious inventions was called a "sparrow persuader" - a flat piece of zinc was cut into the shape of a cat and painted to resemble a tabby cat, which could be suspended from fruit trees or vines by a piece of string. Apparently this device was guaranteed to keep birds away from the trees. The building in which Dutch operated his foundry had a model steam engine fixed to the roof, which was operated by a miniature windmill. He also invented a hand wattle seed sower for use in sowing wattle seed in areas where all the wattle had been stripped. Mt Barker Products, owned my the Malycha family has been operating in the town for a number of years. Their first foundry was on Alexandrina Road opposite the gates of the town oval. During the late 1970's they had outgrown the the building and moved into premises in Victoria Crescent, near the shopping complex on "Duck Flat". Still later, they moved to the new industrial area on the outskirts of the town, near the golf course, where, in recent times, the company has come under much scrutiny for so called "toxic emissions" from their plant. I walked past their factory in Alexandrina Road every day on my way to school and later lived only a few hundred yards from their premises on Victoria Crescent and never smelled anything that could be termed 'toxic' - the cows over my back fence stunk worse than the Foundry did. The "night cart" was driven by Bert Hillman (my maternal grandfather) for a number of years in the 1920's and 30's. The night cart collected toilet cans from people's out-houses and dumped the contents in an area set aside for the purpose, well outside the town limits. The location was actually the hill behind Littlehampton close to the present day South Eastern Freeway, where the Tannery also dumped its wast for a number of years. The first post-office was in the front room of Shepherdson's hut in 1842. 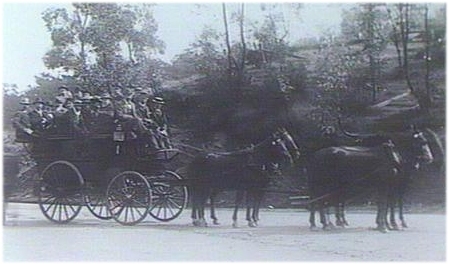 The first regular mail service between Mt Barker and Adelaide was established in about 1844 by a man named Lubasch, a Lutheran emigrant who lived at Hahndorf. His daughter would walk from Hahndorf to Mt Barker to collect the mail, returning on foot to Hahndorf, where her father would take it on to Adelaide in a small cart that he had brought out from Prussia with him, into which he had harnessed two Timor ponies. He would make the trip to Adelaide one day, and return home the next. He did this mail run once per fortnight (2 weeks). After the opening of the railway service, the mail was carried by train for a time, and later still it was, and still is transported by registered mail contractors to Adelaide. In November 1883, the railway line from Mt Barker to Adelaide via Mt Barker Junction opened, and in September of 1884 the rail connection from Mt Barker to Strathalbyn opened. The service between Adelaide and Mt Barker and Strathalbyn ceased to run in the mid 1980's. Today, the Steam Ranger Historic train centre is based in the old Station at Mt Barker. Mr Hombin had the first brickyards in the district near to where the Littlehampton Railway Station used to be, and is where the present day Littlehampton Bricks stands. Mr McDonald had a small brickyard in the north-east corner of the present day Show Grounds. The Coppin family also had a brickyard at Littlehampton. The Childs family had a brick yard on Childs' Road between Mt Barker and Littlehampton which was still operational in the 1970's, although it is closed now. Watts' had a brickyard near Nairne. Greenfield's shop was built of brick - Mr Daw bought it in 1884. He also built the double-story building on the corner of Gawler Street where Symonds' Butchers stood for many years, and where "The Professionals" real estate agency and is now. The building that stood on the corner of Morphett Street, where Giovanni's Restaurant is now, had a 'T' made of bottles built into the front wall with the rest being brick. This was once a wine shop. Opposite the Methodist Meeting Hall in the house on the corner, Mr Waddy set up the first printing press in the district. This was in the 1860's. Later, Mr. Dumas would set up the Courier newspaper, also opposite the Meeting Hall, but not in the same building as Waddy had before him. 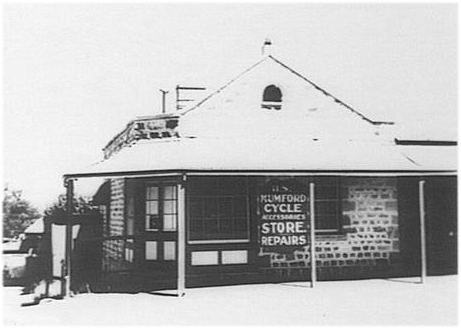 Mr Mumford had a bicycle store on the corner of Walker & Gawler Streets. The building has long since been demolished and the Bank SA building now stands on the site. At a house on the Nairne road, named "Andrewville", the first lawyer in the area lived - Judge Andrews, a magistrate in the courts of South Australia. Salem Cottages were built of brick by John Dunn as a means of low cost accommodation for elderly widows of the area. There were three cottages, each with its own garden and fence. The tennents paid 6 pence per week in rent. These cottages were jointly administered by the three main churches in the town. They were built in the 1860's and have since been transformed into flats. Caleb Potter operated a Tinsmith's shop in the main street on the corner of Walker and Gawler Streets, where Bank SA is now. Chapman's had a seed and grain store in the main street early in the piece. Mr Chapman later built another premises across the road next to the Institute. When he moved into the new shop, the old one became Dumas' printing office. Dumas later built the original "Courier" office at the bottom end of Gawler street next to the old sale yards. Once Mr Dumas moved out of the old shop, it became Fred Stone's auctioneering business. The Salvation Army used it next, and later still it became Andy Callighan's betting shop. Rossitter's boot factory used it next and operated there for over 25 years making boot uppers. When Rossitter's closed down, the shop saw a succession of ownership changes, and today is a book shop. 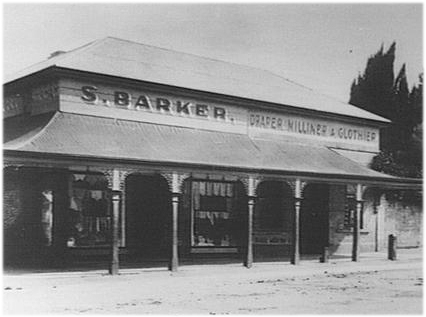 The Barker family also ran a drapery business on the corner of Gawler and Hutchinson Streets for a number of years. Mrs Carrol ran a boarding house in Hutchinson Street, next to the Temperance Hall. George Bollen worked as a cooper in the town while studying to become a doctor. He designed and built Bollen's Bridge on the Springs Road; the building known as "Claremont Tea Rooms" (into which he forgot to put a staircase, so had to add an external method of reaching the ground from the upper level), on the corner near the present day Police Station for Mrs Starling; and a large square home on a hill overlooking the town known to the locals as either "Bollen's Folly" or the "Wedding Cake House". Fred Smith owned the first saddlery in the town. It was situated opposite the tannery buildings on Cameron Road. Roderick McKenzie also ran a saddlery and was a specialist harness maker, making collars for harness horses and teams. Mr Leibing moved to the town in 1864. He lived in central Gawler Street and his saddlery shop was at the top end of the street near Auchendarroch. His son carried on the business in the same location well into the 1950's. The first store of any kind in the town was in the front room of John Dunn's slab hut on Cameron Road. This was built in 1844. Dunn also allowed the use of the shop room for religious worship. Henry Hooper and Mr Brackenridge had a grain and seed store and wine shop in the Presbyterian Church building until 1856, when it officially became the Church. Mrs Starling kept a store in Resurrection Row - a row of cheap rental houses on the bottom end of Mann Street in the area known locally as Duck Flat. Mr Rundle was a butcher. The Teakle family had a mixed business in a house opposite the Doctor's residence on Pridmore Terrace. Mr Wedd had a store in the same general area. The Heinrich family ran successfully businesses in the town for many years. Their first general store was in Albert Place where Mr. Ted Heinrich conducted business for a number of years. There was a modified canon which always stood outside the door of the shop. 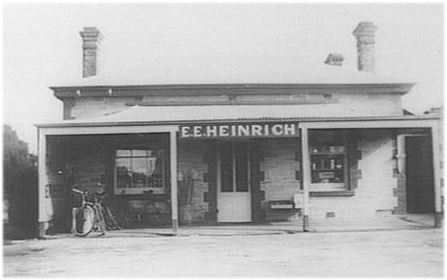 Later, his son Graham ran the Serve-Well supermarket in Gawler Street, and in more recent years, until his retirement, Heinrich's Liquor Store on Hutchinson Street. In the 1960's there was a Safeway Supermarket in Gawler Street, located between HP Chapman and the Chemist shop and across the road, Albert Cousins had a second hand shop. In the 1970's a Foodland Store was opened further down the main street near Rossiter's Boot factory, about where the newsagents is today. Later, a second Foodland opened on "Duck Flat" in Hutchinson Street, a short distance away from the main shopping town. Bi-Lo first opened in the area where Toys'R'Us is today in the 1980's, and a little later Franklins moved into the supermarket which is now occupied by Woolworths. When the new shopping centre was built on the site of the old Tannery, Bi-Lo moved over to the new complex as the major supermarket in the town. More recently, the Bi-Lo complex has increased dramatically with the addition of K-Mart and many other new specialty stores. The Union Bank existed in the town in 1860 - this bank no longer exists at all in the state. Their chief client of the day was the District Council. In 1860 the National bank opened a branch in the town, with a Mr McGregor as manager. Mr Gray became manager in 1863. HRH the Duke of Edinburgh visited the town on 16 November 1867 and was entertained by Mr Gray on vacant land adjacent to the bank. The Bank of Australasia opened its doors for business in 1881. Some of the earlier managers of this bank were Pascoe, Dye, Moore, Bishop, Fraser and Fogg. The Savings Bank of South Australia has seen many changes to its name over the years. It first opened in the town in small premises next to H.B. Chapman's offices. Mr J.K. Bruce was the first manager in 1912. Today, the town boast a whole range of banking facilities for local residents including State Bank, Commonwealth Bank, National Australia Bank, Adelaide Bank, Westpac, ANZ, Australian Central Credit Union, and Savings & Loans Credit Union.